Corporate Travel Management has triumphed at the prestigious 2017 UK Business Travel Awards by winning Best Travel Management Company (£50m to £200m annual UK sales). 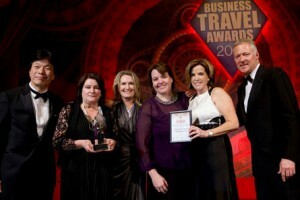 The UK Business Travel Awards are considered to be the ‘Oscars’ of the British corporate travel industry. They recognize and celebrate the achievements of the sector’s foremost businesses, teams and individuals, who have performed outstandingly in their chosen field over the last 12 months. Organized by Buying Business Travel magazine, these awards are renowned for their robust judging process, scrutiny and impartiality. The independent panel of judges, made up primarily of business travel buyers, devote considerable time to review and mark each entry in order to identify those worthy of winning one of these highly valued awards. The Business Travel Awards’ rigorous entry process required preparation of a detailed written submission. CTM’s entry this year highlighted innovative technology developments over the last 12 months including the launch of Lightning, the TMC’s proprietary next-generation online booking tool; CTM’s exceptional creativity in creating bespoke service models for clients; strong financial performance; and impressive 97 per cent client retention rate. CTM UK was presented with the Best Travel Management Company trophy at the Business Travel Awards’ glittering gala ceremony on Monday 23rd January at London’s Grosvenor House. The event was attended by over 1200 leading business travel figures. CTM is an award-winning provider of innovative and cost-effective travel management solutions to the corporate market. Its proven business strategy combines personalized service-excellence with client-facing technology solutions to deliver a return-on-investment to clients. The company employs over 750 FTE in North America and 2,200 FTE staff globally and maintains a global administrative base in Australia. CTM thinks globally, but acts locally by serving clients in 82 countries, including owned operations across Australia, Asia, North America, Europe and New Zealand. To learn more about our European solutions, click here.